Our breeders raise a variety of breeds and breed types. Our services are divers including but not limited to selling show goats, commercial goats, locker meat, guardian dogs and dog training. Again, these are just a few of our services our members provide, but by no means all of them. Please investigate the websites listed below for more details. 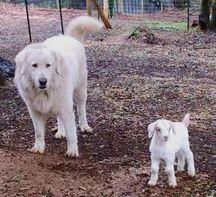 This is Willie, our Maremma Sheepdog stud with a Kiko/Boer cross kid. Breeding quality South African style reds, blacks, paints & traditional Boer goats, annually tested herd & CL/CAE clean. Full bloods, APB percentages. A very hands on ranch. Breeder of quality market and projects for 4H & FFA, also show quality stock as well as pets and meat animals. Breeding for correctness with good bone and muscle. Traditional reds and paints. Boer goats for breeding and meat. 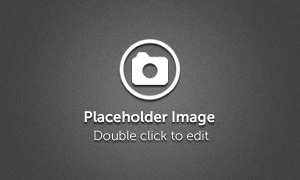 Kiko goats with Peischel breeding for sale. My husband Dave and I use Kiko goats to remove ladder fuel and brush from our property in Yankee Hill. We manage a small, closed herd (20 breeding does) out of Dr Peischel's stock. They kid out in the brush and we select for easy keepers who produce twins. We will have doelings and wethers for sale in July. They will have horns unless you request doelings in March without horns. 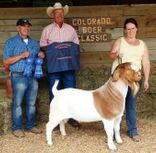 Registered, Fullblood, %, Paints, Spotted and Traditional Boer Goats for market & breeding. We raise ABGA goats and market wethers. Contact us for all your show needs!! Breeder of quality Boer Goats raised for show and market wehters. We raise Boer & Nubian Goats, Dorset Sheep & Berkshire Hogs. We currently have some extremely nice yearling commercial does for sale. Our animals are grass-fed, pasture raised & entirely natural. Our goal; to provide a healthier meat fed naturally without unnecessary antibiotics & absolutely no hormones. We sell meat for the freezer & Goatsticks: Teriyaki, Pepperoni and Hot Pepper. If you are interested in our products or would like more information, please email or give us a call. Raising purebred and percentage Boers, breeding stock and project animals. Nubian and Lamacha family milk goats. CL, CAe & Johne's tested herd. Breeder of quality Fullblood, Purebred & % Boer Goats. Specializing in superior genetics for show, competitive market wethers, showmanship does & gentle family pets. From starter herd to that one special fancy goat to complement your herd we'd love to help. Paints, solids and traditionals. Buck service available. CL % CAE regular testing, will do additional testing on purchase. Quality Fullblood Purebred & Percent Boer Goats. Breeding and Show Stock, 4H & FFA; Market Projects. Quality fullbloods and percentage Boer goats; paints, spots and traditional breeding for market, 4-H and FFA projects. Quality Registered Percentage Boer goats for show, breeding, 4H / FFA projects and pets. CAE/CL tested herd.Will de-horn if requested. Northern California Registered Boer Goats, full blood and percentages. We do not de-horn our kids. 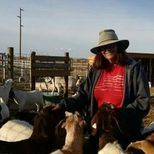 Specializing in youth exhibitor project goats, breeding stock, buck rentals & land clearing in Nevada Co., CA. Providing ABGA registered full blood Boer goat's. Breeder of quality market wethers for 4H/FFA. Have fullblood, percentage & commercial does availible as well. Call or email for information on availible goats. Show and breeding quality fullblood and percetage boer goats. Registered stock, also available 4-H & FFA market wethers. Fullblood and percentage Boer goats. This year Savanahs have been added to the herd to improve pest resistance &the ability to breed out of the "normal" season. We strive to improve our herd each year & offer quality project wethers. There are also a few does for sale each year. All goats are disbudded. FB, % and Commercial Boers; Traditional, Paint, Dappled, Reds & Black Show, Breeding and Market goats. Our herd is Neg. CL/CAE & Johne’s Tested. We provide 4H & FFA wethers and breeding stock and offer an incentive program for 4H & FFA members. Our goal is to offer High Quality Boer Goats at affordable prices . Fullblood, % and commercial Boer goats. Breed for correctness, conformation and a hint of color, including reds, blacks and dapples. We have 4-H and FFA project wethers! 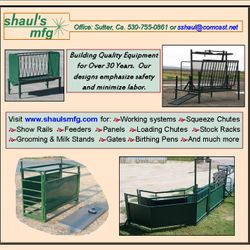 Sutter & Live Oak, Calif.
Manufacturing quality livestock equipment since 1978. Custom designs available. We enjoy working with our customers to make what they need and want. CL/CAE and Johnes tested Boer goats with color. Check out our website to view our hear. Breeders of wether and wether dam style 4H and FFA club goats. ABGA Registered fullbloods, percentages, and, composite meat goats. Hello & welcome to Wilton Boer Goat Ranch where pampered boer goats are our pleasure. We bring to you a combination of some of the finest genetics mixed with a splash of color. We have show and breeding quality fullblood, purebred and percentage Boers that include blacks, reds, paints, spots/dapples and of course traditionals. Our family farm raises quality boer goats. Our focus is on weathers, show and family goats.